The LA housing market is in a tough spot early in 2019. According to CAR.org, the average price of a typical Los Angeles home rose fell from $512,000 to $500k even. That’s down 2.3% from November yet it’s still 1% higher than last December. 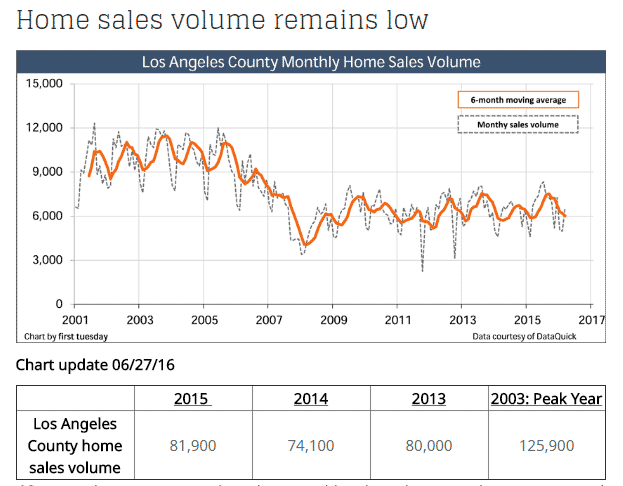 Home sales declined 8.3%, leading some to worry about a crash but real estate market experts don’t believe LA county’s housing market will tank. It will flatten at best, even if more listings appear. Home prices in Malibu will climb toward $3 million this year, showing even tier 1 homes are still in demand. Zillow believes LA home prices will rise $24,000 by Dec 2020. Average rents have risen quickly in the last 4 months ($84 per month). Low home affordability continues to depress buyers across California. Although home prices have fallen toward the rate of wage growth and listings have grown, mortgage rates are rising, lending tightening, and the demand for homes in California’s major city is always brisk. What home buyers are hoping for is housing miracle, yet the market and government are not producing any. There are worries about the California economy and the health of Silicon Valley. The Trump government shutdown is pesky but as business is brought back to the US from Asia, wages will rise and demand will grow again this summer. Yet, the death of Free Trade is changing the state of business across the US. High cost of living and too high real estate prices have some businesses exiting for Arizona, Florida, Colorado, and Texas. That exodus may help ease price rises. According to Zillow, the average price of a Los Angeles home in October is now up to $687,000 a rise of 7.7% YoY. 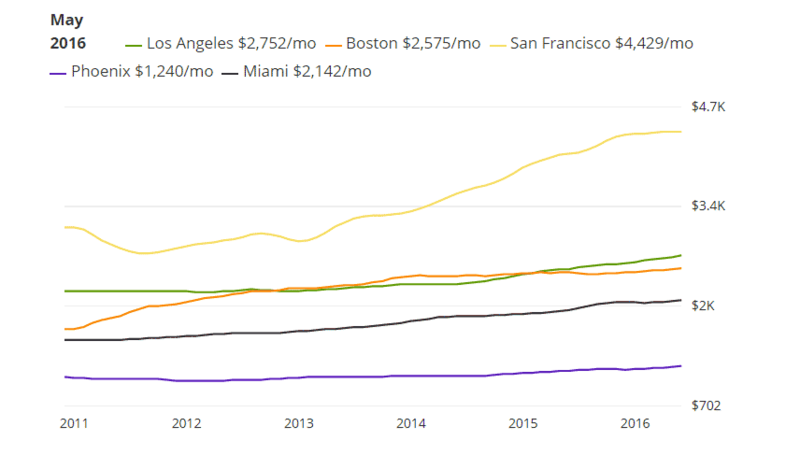 The median rent price is a staggering $3595 per month which translates to near 40% rise in the last 3 years. Single detached homes rose to $726,000 while condos rose to $553,000. Los Angeles home values have risen 9.4% over the past year and Zillow predicted they will rise 5.8% in the coming 12 months. The median price of homes currently listed in Los Angeles is $795,000 while the median price of homes sold is $713,400. This is the same issue in San Francisco Bay Area, Florida, Denver, Chicago, and Seattle where buyers simply can’t afford the lower end of the detached housing market. That’s spawned growth in the condominium markets where more affordable units can be found. The average price for townhouses and condos in California rose almost $40,000 YoY to $476,000. Will rising mortgage rates, tough lending rules crush demand from a growing, vibrant economy? Los Angeles Metropolitan Area saw its average sales price of $515,000 stay the same as last month. Home sales however grew 2.3%. Contast that with the price growth of 14% and sales growth of 6% in the SF Bay area, and 23% rises in Santa Clara, and perhaps LA’s situation isn’t so bad? As this chart below from Zillow reveals, prices of homes will average $726,000 in 2019. The losses from last winter’s fires were estimated at nearly $10 billion with a $500 billion hit to the economy. The numbers are similar to the floods experienced in Houston TX or Miami FL . Some homeowners are discovering they weren’t covered sufficiently with their home insurance. However, it seems the insurance money is helping the economic recovery now. single-family home sales fell 7.6% in January down to 388,800 and down 2.9% from January 2017. January’s statewide median home price was $527,800, down 4.0% yet still 7.3% higher than January 2017.
entry level homes in California rose to $220,000 in California, up more than 10 percent from 2017 when entry-level home averaged $200,000. the DOM for a single-family home remained low at 27 days in January, compared with 36 days in January 2017. The California Department of Insurance said the fires cost $9.0 billion in insurance claims so far, which was 3 times the $3 billion claimed previously. For the next few months however, California housing will be in extra short supply. The OC Register reports that CEQA lawsuits against developments are a serious issue for California housing, especially in the LA area. As Los Angeles residents suffer financially, and while housing crash rumors float around, prices are rising. You’ll need an income of $120,000 to buy a home in LA in 2018. Prices of condos in downtown LA are reportedly $90,000 higher than last year. Is it instinct or just common sense that California will continue as the most desired place to live on the planet? Does the climate in San Diego, Sacramento , Bay Area, and Los Angeles, high paying jobs, interesting geography, lifestyle and recreation, make California a magnet for people around the world. Price growth is predictable. In 2018, real estate sales in 2017 in California eased, however house prices remain high in Los Angeles, Orange County, San Diego, and San Francisco / Bay Area housing markets which had previously approached prerecession highs. 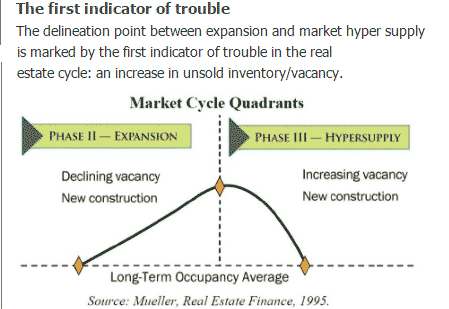 But will they rise further and is this the right time to invest in an income property? Is 2019 a buyer’s market? The short answer is Yes. Houses for sale in Los Angeles County and Orange County are in short supply and new residential development is not keeping pace. It would take a market crash to stop the price rise and even then it would only be for a few years. For wealthy investors, a few years is well worth the wait. The question is where to get a realistic price? The hunt continues. CAR reports the average house price in LA rose about 10% in late summer of 2017. San Bernardino, Riverside, and Orange County had strong price growth of 8% to 10%. Contrast that with the drop in the Bay Area of more of about 3% or $14k to $33k for detached homes and you realize LA is a more attractive housing market for property investors. The effect of the fires will be to reduce availability and raise prices. So not much relief in site for the LA market. As in most housing markets across the US, millennials have been shut out of the markets. They’re in their child bearing years and have saved up small fortunes to ready them to finally purchase. They’ll be buying in LA or Orange County somewhere. Sales volume actually increased 11.5% in the last month, so homeowners appear to be loosening up finally. Realtors are wondering how they can get people to sell their homes. 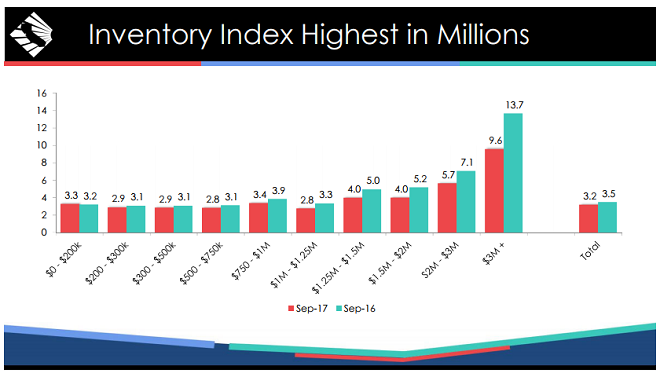 Inventory is the big story for the fall of 2017. This graphic from CAR.org’s latest report shows inventory in California is sharply down from last year. Sales above $500k were up up. Active listings in the lower price ranges are down considerably ( -10% to -28%). And real estate investors are hopeful they can find the right property in the right city or zip code. Zillow has forecast house prices in Los Angeles to rise throughout 2018 while CAR shows it moderating. A lot depends on the political climate and interest rates. We should keep in mind that only 30% of Californians own a home so the door is wide open for opportunity and new sales, particularly with first time buyers. The problem is that homeowners don’t want to sell and buyers can’t afford the prices. 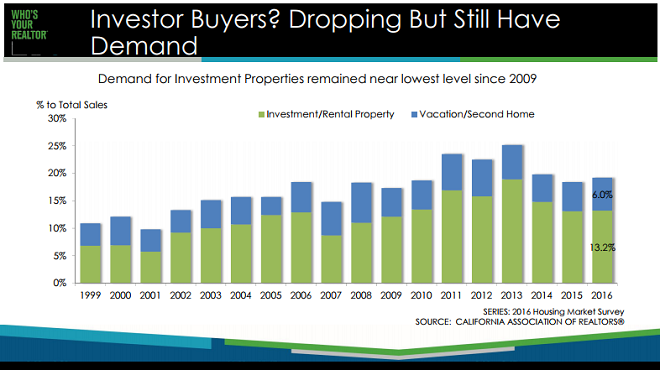 Why are Buyers Buying in California? CAR’s 2016 survey showed only a small portion of buyers buy property as an investment. Only 13% are real estate investors. The US economy will pick up steam and Californians will be buying a home again even if they have 1 hour+ commutes, higher interest rates, and out migration to remote towns. Check out the top housing factors below affecting housing prices in discover a better homes for sale search process. If buyer’s are hoping for bargains in the next 4 years, they’re unlikely to find them. Despite a dip in September, prices for homes and condos are up $24k to $30k from one year ago. Are the Asian and Persian buyers pulling out of LA? The Trump instability and trade issue might be a pause before even more money pours into the reviving American economy. Make American Great Again, also creates excellent investment opportunities in California, paying out in $US. It’s the Los Angeles housing forecast that is perhaps one of the most interesting forecasts for the US for the next few years. California’s housing developers are hard pressed to build homes to house the population. We can speculate that homes will rise in price for the next 4 years. It’s not easy to predict though when people are talking real estate bubbles, NAFTA cancellations, Brexit, skyrocketing prices, vacillating oil prices, reduced immigration, and presidential elections. Overall, the Los Angeles forecast was very good for sellers with plenty of demand and with the average price of a home hitting $690,000 last summer. Affordability is dropping though and only 30% of LA county residents own a home. Given the nasty commutes Los Angeles workers are enduring, this housing crisis should be a top priority for the California state governor. A few pundits are suggesting homeowners need to build granny flats in everyone’s back yard. Political battles are forming over the effect of regulations on LA’s and California’s home construction. Who will win? Will they battle Trump head to head to stop new development? The situation may become worse than what San Francisco, Vancouver, and Toronto have been through, and what Miami, New York, and Boston may be into now. LA Curbed’s list of hot zip codes: Los Angeles’s 90012 zip code is shaping up to be the 2nd fastest growing area in the nation at 8.8% growth, 2nd behind only Gilbert AZ. The 90012 zip code includes Chinatown, the Civic Center, Elysian Park, Victor Heights, parts of the Arts District and Bunker Hill, and most of Little Tokyo. Read more on the best zip codes in the US for investors and homebuyers. 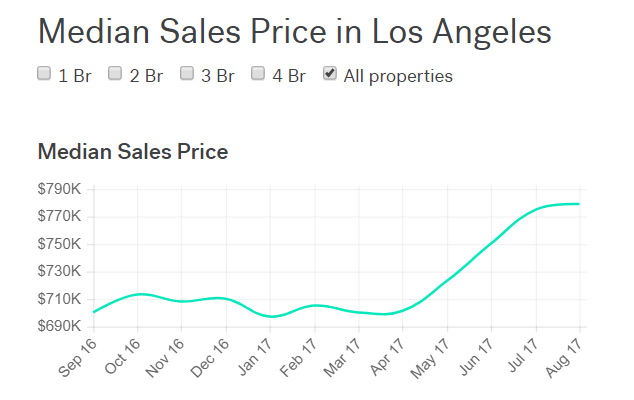 LA Home Prices Fully Recovered? The Los Angeles home price graph below courtesy of Zillow shows how prices have almost returned to pre-recession values and are beginning to level off. To forecast prices and demand for the LA region, we’d have to examine the cause of the moderation and if it’s a fact. Here’s LA’s hottest zip codes. Last year, home prices in LA rose 7.8%. That’s a fairly strong ascent to just snap out of, so we’re left wondering what really is the outlook is for the 2017 to 2020 period? With prices high and rising, it makes sense that the number of buyers will dwindle (preferring to rent) and a leveling off would occur. It seems however, this is more of a guess by forecasters not really backed up by a solid consideration of all the factors that will be in play during the next 4 years – defeated regulations, growing economy, and reduced immigration. Do you believe we’re in a California housing bubble? According to a Harvard real estate guru, bubbles don’t burst until demand dries up — an increase in unsold inventory and that’s not what’s happening. Sales are strong and California home prices are predicted to rise further. As you’ll see from the data in this post below, there is huge demand for property. Supply is the problem. 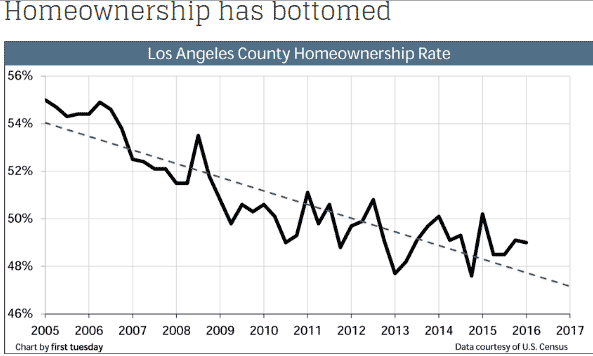 This intriguing graphic courtesy of https://journal.firsttuesday.us/ reveals that home sales in Los Angeles is actually well down from historical levels. The likely reason for that is lower income buyers simply have even less income to buy and of course the high prices. Home ownership is lowest in California. A complete recovery of around 110,000 annual home sales will likely occur in 2019-2020, as end user demand in Los Angeles County is buttressed by a Great Confluence of Baby Boomers (Boomers) and first-time buyers who are lured by further employment (needed to accommodate population growth of roughly 1% annually since the beginning of the Great Recession). That’s a forecast growth of about 20,000 homes per year over current current 2016 levels. Another interesting stat provided by firsttuesday is the very low rate of home ownership and how much it’s plummeted. It’s on the uprise now, and you’re left wondering whether Trump’s renewed emphasis of America First will encourage the growth of home ownership? 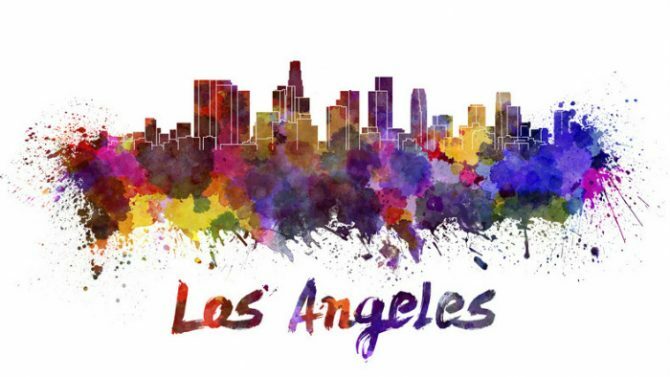 The forecast for economic growth for the Los Angeles is optimistic at this point. Visit https://laedc.org/2015/09/30/new-2016-2020-economic-forecast-published-93015/ for the most recent info and their forecast up to 2020. 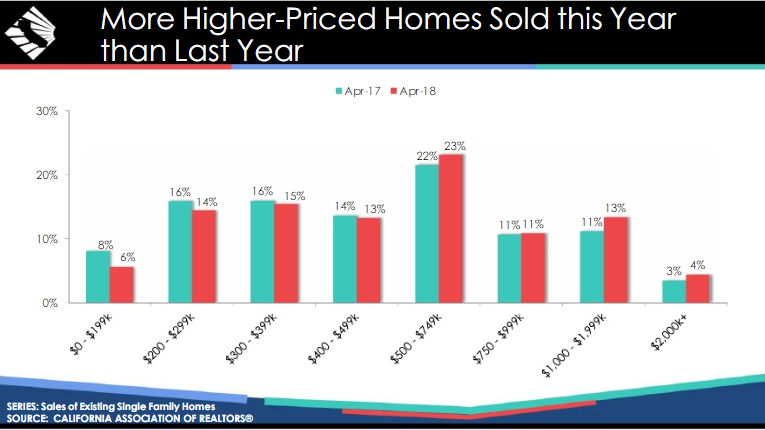 This Stat from CAR shows homes have been on a rollercoaster ride of sorts yet, 2016’s expected resale volume is still well down from 2011 and 2012’s highs. If incomes should rise in the LA area, it could have the effect of stimulating new housing construction and increase sales of homes. With the number renters skyrocketing, there’s a huge pool of potential buyers. This graphic reveals the exceptionally high cost of renting in Los Angeles compared with other major centers. The housing availability problem isn’t isolated to California or LA, it’s a US wide issue. The high housing costs in the coastal California areas however may prevent many skilled workers from migrating to LA to work. Startups for instance may be forced to leave San Francisco, Bay Area and LA because of the cost. San Diego County may be a better option for the short term. 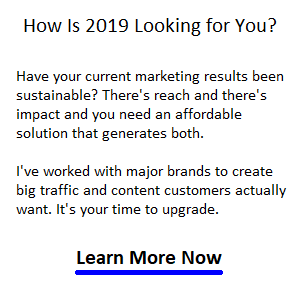 Realtos: Check out other posts providing realtor tips, prospecting strategies, social media strategy, and tactics used by top flight luxury realtors and even lead generation companies. See additional housing market reports on New York NYC, San Diego CA, and San Francisco CA. Question: what is your opinion about becoming a Mortgage Loan Originator in today’s market? I am seriously considering to make move. Can’t offer any advice for you George. There’s 8 percent growth and most have only 4 years experience. If you’ve got what it takes in terms of skills, knowledge, interpersonal and marketing skills, it might be a sustainable career for you. Good luck!